July 26 is the 150th anniversary of the death of General Samuel Houston, one of the most important figures in the history of Texas. He commanded the decisive surprise attack, Battle of San Jacinto, that led to independence from Mexico, was elected the first and third president of the Republic of Texas, encouraged annexation into the United States, was elected Senator and Governor, was against secession prior to the Civil War and is the namesake for the country’s fourth largest city and many other Texas places and institutions. 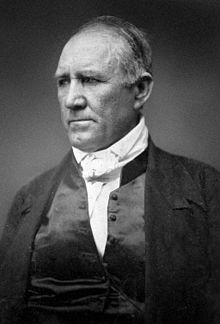 Sam Houston is also my first cousin, six times removed, hence his appearance in this blog. My great-great aunt, Lucy Lee Mahan (aka “Aunt Dude”), had often said we were related to Sam Houston (among other notables, who will be subjects of other blog posts). After I began to take an interest in our family’s history, proving the veracity of such lore was one of my initial goals. To start, all I had were Dude’s files, which were all hand-written, and included no mention of specific links to any of the famous folks to whom she’d said we were kin. Proving our relation to Gen. Sam Houston, however, turned out to be pretty easy. Robert Houston & Margaret (Mary) Davidson had six children, including Samuel (1745 – 1807) and Esther (1743 – 1847). Samuel & Margaret Paxton had nine children, including Gen. Samuel Houston (1973 – 1863). William & Ann Van Lear (1781 – 1843) had at least four children, including Margaret Jane McKee (1813 – 1855). Arabella & Lee Mahan (1836 – 1920) had 11 children, including Kate Mahan (1868 – 1947) … and Lucy Lee Mahan (Spilman) (1878 – 1962), whose genealogy files I have. Kate and Dave Jackson (1856 – 1922) had six children, including my maternal grandfather, Walter Mahan Jackson (1898 – 1956). If I were near Houston this weekend, I’d attend the commemoration of the General’s death and funeral, which will be held Friday and Saturday at the San Houston Museum in Huntsville, Texas.